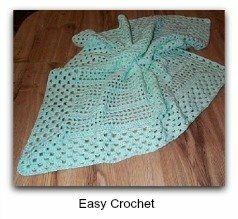 If you crochet baby blankets, or are wanting to learn how to crochet than this pattern is a wonderful project for you. I think this is about the easiest crochet pattern there is. The new parent and baby will have the comfort of being wrapped in a handcrafted heirloom, which may be passed down from generation to generation. Many times these are so well loved throughout all of childhood. Many people enjoy receiving handmade gifts for their new baby as they feel that these gifts, made with love, have a special sentimental value beyond something store bought. Also you can personalize this blanket by using the colors in the new nursery. Many people are intimidated by the idea of creating a handicraft like crochet baby blankets, but crochet is actually one of the easiest crafts to pick up. Using a single crochet hook and some yarn can be create elaborate patterns or an easy but beautiful pattern like this one. It is easy to control the tension and gauge of a crochet project, which makes the work neater and looking more professional. Using this pattern will help you become comfortable with handling the yarn and hook. If you need help with the crochet baby blankets patterns you can find lots of help online. Such as Ravelry has a great deal of information. Take a few minutes to practice chaining and creating an even gauge. Be sure to get the right size hook for your yarn, as it can be frustrating to try and catch thick yarn with a tiny needle. 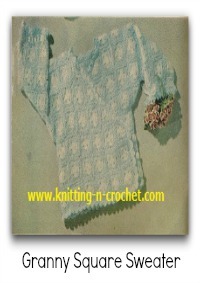 Hooking thin yarn with a large needle may leave your pattern more lace-like than you had intended. I also have some help here How to Crochet baby blankets. Blankets or afghans can of course, come in all sizes and colors and half the fun is choosing the yarn. Wouldn't it be adorable to give a baby a blanket based on the colors of his mother's wedding, for example? Although of babies also need onesies and clothes, there is a special bond between a little one and his "blanky." By giving the gift of a baby blanket, you are giving a newborn a gift of love and security that he can keep with him or her throughout his life. Working down one side: 2 sc in each dc to corner, 3 sc, across bottom: 1 sc in each starting ch, 3 sc in corner, working up other side: 2 sc in each dc, 3 sc in corner, across top: 1 sc in each dc across top. Row 2 of boarder: join with a slip st to first sc, ch 2 turn, 2 dc in same sp, ch 2, 3 dc in same sp, *ch 1, skip 3 sc, ** 3 dc in next repeat * across (corner) skip 2 sc, 3 dc, ch 2, 3 dc in same space repeat * down side to corner than repeat all around outside.